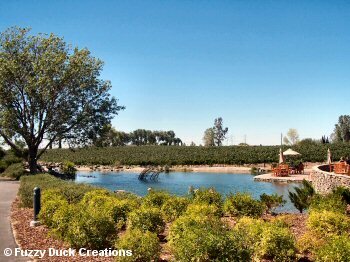 Central California dog friendly wineries - You love to travel with your dog. We present here a list of wineries on the Central Coast that are happy to see you and your best friend. Until recently, it has been rather difficult to travel with your dog. Hotels had been less than accommodating to pet friendly travelers. The trend is changing with proprietors of many businesses allowing pets (with some conditions). The city of Carmel has long been one of the most pet friendly places in Central California. And they have set the mark for dog-friendly beaches as well. Now wineries are loosening up a bit and allowing dogs (as long as they're friendly with other pets and people). I've put together a list of wineries in the area which do allow dogs and in a few cases right into the tasting room as well. 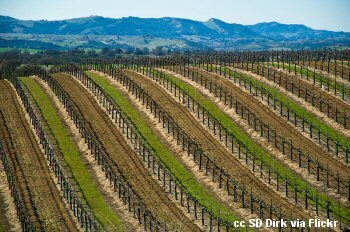 Kirigin Cellars was founded in 1916 which makes it one of California's oldest wineries. "We’re dog-friendly! Your dog can run here! 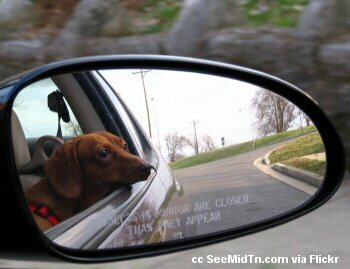 Want to bring the entire family wine-tasting, but are worried about the pooch feeling cooped up in the car? Your dog is welcome to stretch all 4’s on the fields. Also available for dog club events." 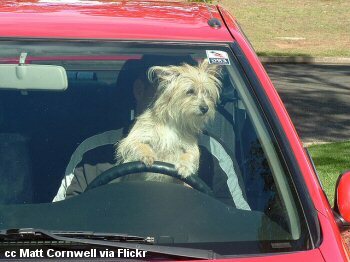 Your dog probably won't be driving to the winery, but they won't have to stay in the car at these pet-friendly places. On leash and friendly with others. On leash and friendly with others. Eberle also has one of the few wine caves in the Paso Robles area. "Dogs are welcome on leash in our outdoor picnic area in front of the tasting room only. Unfortunately, we cannot accommodate pets in our tasting rooms, in our barrel caves, or on our tour route. *Service dogs and service dogs in training wearing identifiable vests are welcome in all areas." 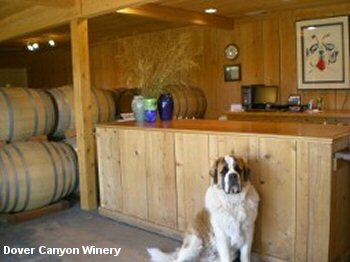 This is the winery with the big St. Bernard shown at the top of the page. 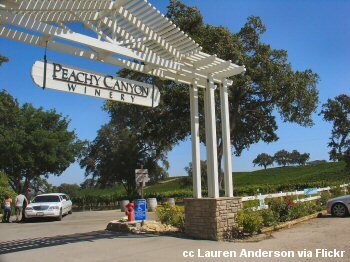 "The Peachy Canyon "Old School House" tasting room, located in the heart of Paso Robles' wine country on Highway 46 West, remains a landmark attraction. The historic Old Bethel School House (circa 1886) is definitely a must visit. Come taste the world famous Estate Zinfandels or any of the other 15+ handcrafted small batch Rhone & Bordeaux varietals you can't get anywhere else." Dogs allowed in tasting room if leashed and friendly. 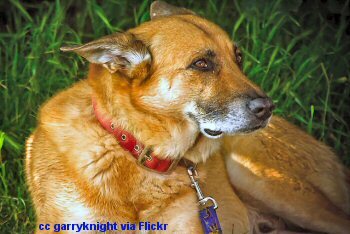 Dogs should be friendly with others and leashed. 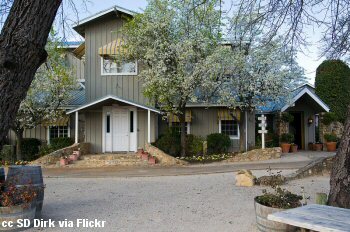 "Our tasting room is a newly restored 1920’s craftsman style house on the historic Foxen Canyon Wine Trail. We invite you to enjoy our wines and exclusive vineyard views in our comfortable yet elegant tasting room. 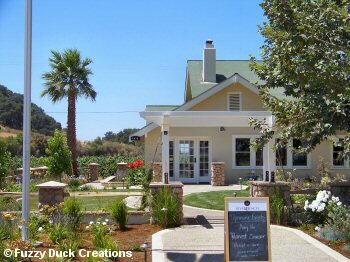 Our beautiful outdoor patio area is ideal for a wine country picnic, and vineyard and winery tours are offered by appointment. 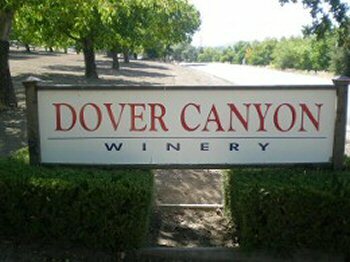 Our Tasting Room is open from 10:00 AM to 4:00 PM daily. We look forward to your visit! Please call us for a reservation for groups of 8 people or more."